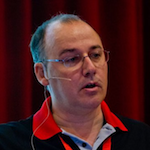 Didier Stevens (Microsoft MVP, SANS ISC Handler, Wireshark Certified Network Analyst, CISSP, GSSP-C, GCIA, GREM, MCSD .NET, MCSE/Security, MCITP Windows Server 2008, RHCT, CCNP Security, OSWP) is a Senior Analyst (NVISO https://www.nviso.be). Didier is a pioneer in malicious PDF document research and malicious MS Office documents analysis, and has developed several tools to help with the analysis of malicious documents like PDF and MS Office files. You can find his open source security tools on his IT security related blog at https://blog.DidierStevens.com.